SPA - SobiPro Ajax search is the module developed by Ossolution. It allows user can search SobiPro entries through the search form. The module uses the Ajax method for searching. It provides the attractive effects, it can also show the result quickly in current page instead of loading new page. 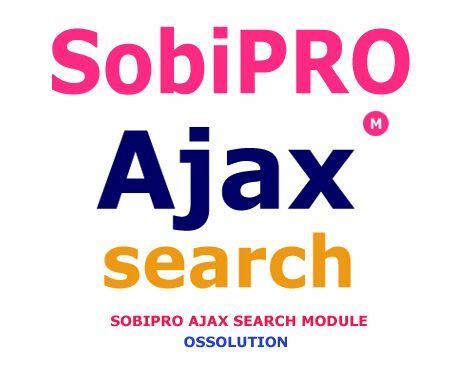 Attention: New version of OS Sobipro Ajax search released 28th June 2012. Allow multiple search modules for one site. Each module can search the entries for one Sobipro section. c. Administrator can setup the SobiPro categories that the search module will search through. d. Administrator can select to search through custom fields. e. Administrator can select to allow customer to filter result via Categories. f. Using Dodo Js script. The package has one module (mod_ossobiproajaxsearch) and one component (com_ossobiprosearch). You need to install both module and component in to Joomla. After install the component, you can go to Component > SobiPro Ajax search Configuration. Here you can manage the configuration paramaters for the search module. Administrator can select the extra fields that the search module will search through. SobiPro offers the ability to categorize entries by Categories. Categories may also contain subcategories enabling storekeepers to manage their entries in as much detail as possible.The multile select list all the SobiPro categories, here you can select the categories that the search module will search through. The categories are from Section you have selected above. The text is shown when no search result back. Default text is : No companies found for the keyword! Width size of the search result. When you purchased one of Sobipro Ajax search module with the cost is $ 20.68, you will get free upgrade it for one year. However, we might (and have the right) to change this rule in the future. For example, we might consider changing subscription length to 12 months subscription, or 6 months subscription.... If we do so, we will extend your subscription time as if you just purchased the subscription at that time.